Robert Scott Morency has worn many different hats in his pre-hospital care career. 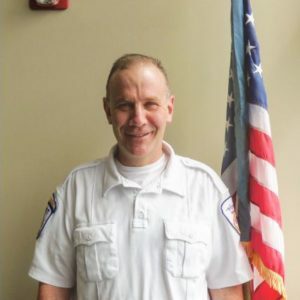 Since his discharge from the US Navy in 1991—he was a corpsman in the Marines for seven years—Scott has dedicated his life to serving the sick and injured in Massachusetts as a Paramedic, firefighter, EMS manager, risk and safety manager, and clinical educator. In Scott’s current role as Armstrong’s clinical services manager, he instructs not only Armstrong employees but also first responders and EMS providers from local police and fire departments in such areas such as ACLS, CPR, PALS, PHTLS, TECC, LEFT, AMLS, and TEMS. Scott is a true people person, and he is able to relate to his students in both the private and public sector, making him an invaluable resource. Scott also serves as a clinical liaison between Armstrong and various municipalities, hospitals, skilled nursing facilities, urgent care centers, and assisted living facilities, giving them an easy channel of communication and tailoring programs to meet their specific needs. Throughout his eight years at Armstrong Ambulance, Scott has gained an impressive reputation as an instructor, and he continues to receive high marks from his students. He is known for making complicated subjects easier to understand, and he can connect to providers at all career levels. Scott has a passion for improving pre-hospital care through education, and he is frequently called on to mentor new EMS providers. Scott has made a lasting impact on our employees and also significantly impacted the development of all trainees by building a Patient Care Simulation Laboratory on site at Armstrong Ambulance. As a result of his efforts, Armstrong’s customers benefit tremendously by practicing patient care and emergency response skills in a realistic home- or hospital-like setting. Scott’s other major accomplishments and contributions include serving as Armstrong’s Designated Infection Control Officer (DICO) and Safety Committee Chair, as the Northeastern Law Enforcement Council’s (NEMLEC) Tactical Medical Operator/Supervisor, and as a member of the Massachusetts Region IV Pre-Hospital Systems Committee. When he is not working, Scott enjoys spending time as a Delivery Captain in the summer and as a competitor on the Ridgeway Racing snowmobile team in the winter months.